Cathi Lamp's work on the development of a "nutrition plate" educational tool typifies her role with UC ANR Cooperation Extension. She was able to identify a need in the community, find a solution, research its effectiveness and see the results benefit society. This led to a statewide research project to evaluate the use of the plate showing the proportions of foods needed for a healthy diet. Lamp worked with Connie Schneider, director of Youth, Families and Communities for UC ANR, and Margaret Johns, nutrition, family and consumer sciences advisor in Kern County, to determine the types of foods the families they were teaching typically eat. 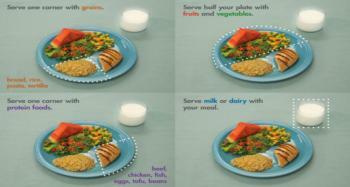 The team prepared meals and took photos showing healthy food combinations on a plate. They showed the photos to families to get feedback and made changes for maximum educational effectiveness. "For example, we initially put fruit on a plate with spaghetti and green salad, and people thought that was odd," Lamp said. "Instead we put the fruit in a small bowl that was photographed on the plate, but could be removed and eaten on the side." 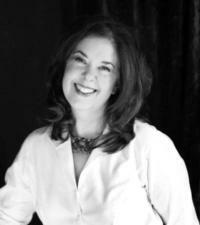 Cathy Lamp earned master’s degrees in nutrition and public health at UC Berkeley. She began her career in Tulare County as head of the Special Supplemental Nutrition Program for Women, Infants and Children (WIC). It was there she got her first taste of applied nutrition research. “It helps to be curious,” Lamp said. “I’ve always really enjoyed the research because I always wanted to know the answer." “The most exciting thing about Cooperative Extension is that there isn’t someone dictating what your research agenda is. I’ve always flourished in a situation where they let me go after my curiosity. Some people like to be told what their job is all about, but I love exploring and trying new things." After many years in the nutrition field, Lamp came to the realization that “when parenting isn’t going well, very often nutrition isn’t going well either." Serving children sugary soda with dinner is not good for children. Switching to low-fat milk or water can be challenging. Whether its a dad with a picky toddler or an angsty teen refusing to eat vegetables, it may seem like it takes a spoonful of Mary Poppins’ magic to get kids to eat healthier, but Lamp has another idea. “The parent needs to be a role model for the child. We see this constantly in the psychology and nutrition literature, children will model, or copy, their parents/caretakers behaviors," she said. With older kids, try giving them a choice between two healthy options. The child will feel empowered and the parent/caretaker can rest assured the child is eating right. It’s a win-win solution. Lamp and her team came up with multiple plate pictures depicting healthful meals, including a sandwich/torta plate, spaghetti plate, chicken plate, fast food plate, and plates for smaller children that do not have the same nutritional needs as older children and adults. The impacts of Lamp’s work can be seen across the state. After leading a team to improve nutrition standards for her county, Lamp shared it statewide. She and her team continued to do research to make sure that the curricula was effective.